First the sand … then the flats. As Mike and I trudged across the barren dunes of Padre Island National Seashore, leaving the wind-whipped waters of the Gulf of Mexico behind us and looking forward to our last visit of the Lower Laguna Madre, a scene from the 80s flick “The Sure Thing” flashed through my head. While we did get to experience “Feelings” played by an enthusiastic tenor sax player in an awesome Italian restaurant on the border with Mexico (yes, seriously) and … wait for it … “another non-stop block of Christian country!” our hurdles were muted compared to those experienced by Gibson in the classic Rob Reiner flick. But fishing had been … slow. For all the miles we’d put on the rental car, the kayaks and a buddy’s boat, we were woefully lacking when it came to results. I suppose you could blame it on the unexpected—brown tide, a steady 40-knot wind and three guys who spend most of their time fishing for trout in tiny backcountry haunts–but we weren’t sated by just being being in Texas and soaking up sun and 80-degree days. We’d connected a few times with some small redfish and Mike and I each checked a black drum off our life list, but we were still hungry. Todd was a player on our first visit to the dunes, but the relentless wind—and maybe a slight hangover and the view of the pool from the balcony—kept him back at the hotel watching a “Law and Order” marathon while we made one last journey to the water. We topped the last ridge of taupe sand mountains and leaned into the stiff breeze. The Laguna, green and glistening in the afternoon sunlight, stretched out before us. Our bare feet—we were quick studies, and jettisoned our shoes after the first walk across the powdery dunes—dug into the warm sand and it seemed, just for a minute, like the wind took a breather. Miles across the water we could see the mainland; the famous King Ranch and its sprawling mesquite forest stretched to the horizon. Minutes later, we stood up to our ankles in the tepid Laguna, eyeing the clear water before us for all things fish. Mike and I waded 20 yards apart up the shoreline atop the firm sand flats that would be perfectly at home in the Bahamas. The wind was thankfully at our backs. We watched carefully for tails and the tell-tale “nervous water” that bonefish junkies know on sight. It took some time—and I firmly believe that seeing fish on the flats is something that takes practice… repetition—but I finally eyed something worth casting to. His head snapped quickly to the location on the dial, but he couldn’t make out the dozen or so fish rooting in the sand for small crabs. A month removed from my first fruitless visit to the Bahamas, I could better identify the vertically barred fish moving toward us at 40 yards. “I got nothing,” Mike said. The fish weren’t really tailing, so much as slowly cruising and stopping, almost in unison, to sift through the sand in search of crabs and shrimp. 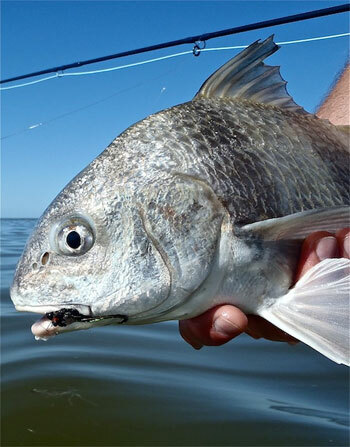 They weren’t the storied redfish of South Texas flats, but they were fish, and, at that moment in time, any fish would do. I loaded the 8-weight and made a serviceable cast, but my shrimp fly was ignored by the notoriously finicky fish—well-known photographer Tosh Brown calls them “prison permit” thanks to the striped outfit they don on the flats and their rare inclination to take a fly. I looked up the shore, and could see another pod of the saucer-shaped fish headed our way. Quickly, I changed flies to something more crabby. It, too, was ignored. Time for a third fly, a Merkin left over from the just-past Bahamas trip. 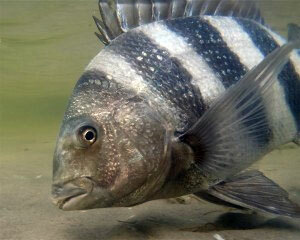 As I cinched the knot on the 10-pound leader, I saw a line of sheepshead moving laterally from me at about 11 o’clock. I managed my best cast (maybe of my life), and put the fly three feet ahead of the lead fish. Strip. Let it sit. Strip. Line tight. Minutes later, as Mike stood behind the lens of the camera and captured the moment in megapixels, I revived the remarkable fish that fell for the crab pattern. As I watched it swim off to rejoin the pods of sheepshead that kept coming along the shoreline, the trip fell into perspective. Yes, fishing was slow. But sometimes… all it takes is one. As I hummed “Feelings” on the forced march back to the car to stay ahead of a thunderstorm that seemed to appear out of nowhere, I was finally sated on the sand flats of south Texas. And … spoiler alert: just as I got my fish, Walter Gibson gets the girl. But not the girl you might think.